420D nylon badge holder with a neck cord which has a breakaway safety clip. 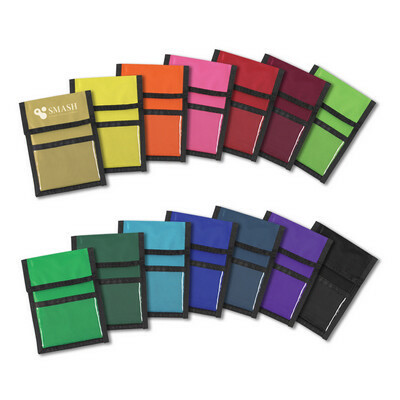 Has a clear 101 mm x 76 mm plastic badge window, a business card pocket two pen loops and an internal compartment with a zip cloure. A production lead time of 10 - 15 working days applies to this product. Colours: Yellow, Orange, Neon Pink, Red, Lime Green, Kelly Green, Khaki, Forest Green, Turquoise, Royal Blue, Navy, Burgundy, Purple, Black. Dimension: W 127mm x H 168mm. Print Description: Front - 76mm x 25mm (one colour). Print Type: Screen Print. Packing: Loose packed. Less than minimum quantities are not available for this item. MOQ applies per colour on this item.. Price includes : Printing Per Position. Setup is included.